If you train hard enough and push far enough, whether it’s after a high-intensity conditioning workout or on the backside of a long and brutal lift, you’ll inevitably find yourself on the brink of exhaustion. You know the scene: you’re doubled over, dripping sweat, praying for the energy to endure one more rep, step, pump, or breath. 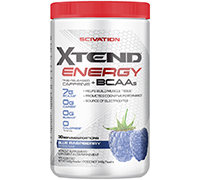 XTEND® Energy is engineered to help you power through these very moments. Unlike other energy-infused aminos, XTEND® Energy provides a combination of quick-hitting fuel and time-released caffeine to keep you training at your peak for the long haul. Since ZümXR® delivers caffeine for up to 6 hours after your first sip, you can count on Xtend® Energy to work when you do, as hard as you do, for the most enduring workouts. As a dietary supplement, mix each level scoop in 10-14 fl. oz. of water (adjust for taste preference) and shake well. For best results consume 2 level scoops per day. Do not take this product within 6 hours of bedtime. 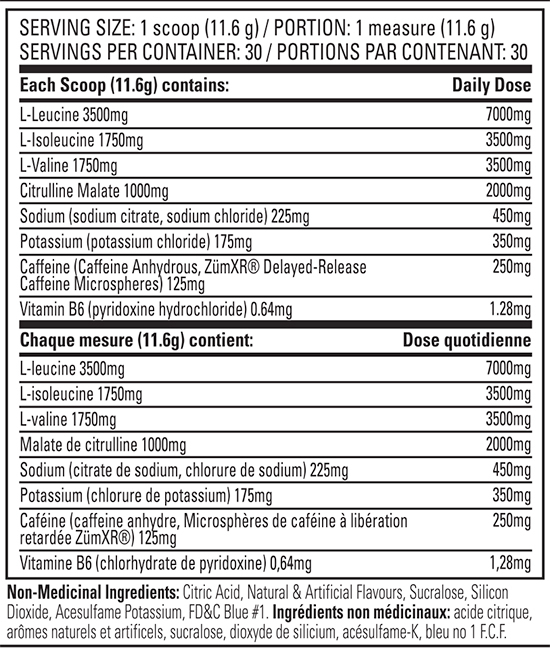 DO NOT EXCEED 2 SCOOPS WITHIN 6 HOURS OR 3 SCOOPS PER DAY.